Sony have entered the netbook market with their new W Series. Sony are not new to making small laptops, I had the really nice SRX41P back when I worked for the Western Colleges Consortium, and currently have been playing with the P series. However one thing you could always say about Sony VAIO small laptops was though they were small in size, they were big in price. The SRX41P was nearly £2000, whilst current small models are nearly as expensive. However the W series is going to be much cheaper, currently $500 in the US, UK pricing has yet to be announced, but I would guess it would be in the £400 mark. It’s not a netbook that is going to be a real powerhouse. Running Windows XP, 1GB of RAM and a 160GB HDD it’s no different to a lot of netbooks in the market. It has a 10.1″ screen with a 16:9 aspect ratio. As well as the ubiquitous Sony Memory Stick Duo slot there is also (like the P series) a SD card slot. Alas like a lot of netbooks it only has a two hour battery life. It doesn’t look a lot different to other netbooks (well except you can get it in pink) but Sony is a brand that a lot of people trust and therefore I expect it might sell quite well to people who like Sony stuff, get the feeling that they may be disappointed. Does make you wonder though if Apple will now take the plunge and enter the netbook market? Sony Corp is considering developing a cellphone-game gear hybrid in a bid to better compete with Apple Inc’s highly popular iPod and iPhone. The PSP is a very popular gaming console, I can’t though see the PSP Phone as an alternative to the iPhone, but more a different beast appealing to a different audience. 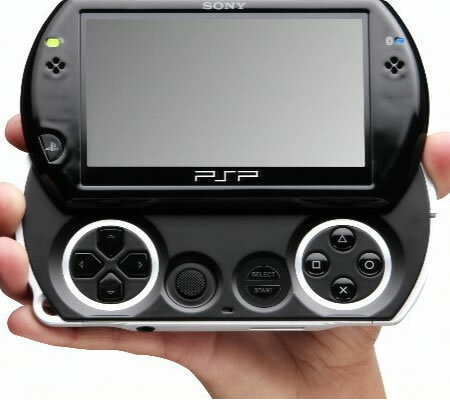 So is this the new PSP? Video and photos of the PSP Go have been leaked online, revealing a smaller, more lightweight console that has dropped the failed UMD disk format. Engadget has some leaked stats. From a learning perspective the 16GB of Flash storage is helpful as anyone who uses the PSP knows that the Memory Stick can sometimes go missing… generally to be found in the card reader of a PC. Alas it uses the small Memory Stick Micro format which means getting another adapter or ensuring that your current card reader can read that format. Disappointed that there is no built in camera. I am really starting to see some of the real educational possibilities of GPS and location based learning. One of the key features of using images in location based learning is the ability to add geo-data the images and video taken by a camera. Sony have announced a new HD Camcorder with GPS capabilities. Perfect for travelers, this camcorder features a built-in GPS receiver that automatically adjusts your camcorder’s clock to the proper time zone and lets you view your current location on the LCD map display, as well as “tag” your shooting locations. You can view your tagged videos and pictures via the Map Index function or after you’ve downloaded them to your PC. As with any HD camera, the technical specifications are pretty good. Capture all the action on your next trip with this ultra-portable, titanium-bodied Handycam® camcorder. It features Full HD 1920 x 1080 video recording, 4MP still shots. Sony have also moved to solid state media as well. Overall an interesting camera, but does GPS add the value for what is still an expensive camera. You are currently browsing the archives for the sony category.